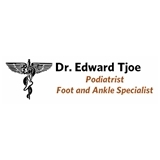 Dr. Edward Tjoe (Foot and Ankle Specialist) (Jersey City) - Book Appointment Online! I found the doctor thorough, competent, personable, a bit hesitant. I have confidence that the doctor will help relieve my pain.